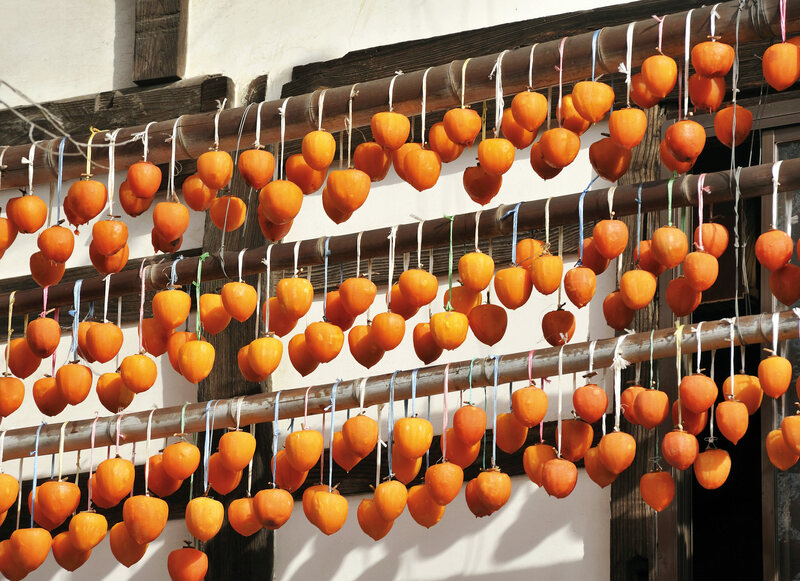 In Japan, the most exquisite fate for a Hachiya persimmon is to be hand-dried into a delicacy known as a hoshigaki. Hoshigaki are frosted white with naturally occurring sugar crystals. Fresh persimmons are unreasonably orange and taste lightly caramelized and spiced, as if somewhere in their ancestry they were crossed with a sticky toffee pudding. They belong to the genus Diospyros, in Greek, “the fruit of the gods,” and the two types you’re most likely to find at the grocery store from October to February—Fuyus and Hachiyas—are Asian cultivars (rarer varieties like the enticing “chocolate” persimmon are fun but elusive, so we’ll leave them out for now). Fuyus are plump and squat, like baby pumpkins, and can be eaten crunchy, out of hand. These are the kind of persimmons you’d slice up into a salad or eat as a snack, maybe with some hazelnuts (try it). Hachiyas look more like human hearts. Bite into a firm one and your mouth will be overcome with a waxy, puckering astringency (which, strangely, a bite of Fuyu can instantly dissolve). When ripe, they feel like liquid-filled balloons, because their middles have gently jellied into nature’s own custard. You can cut the top off and eat the inside with a spoon, or scoop it into the batters of baked goods. In Japan, the most exquisite fate for a Hachiya is to be hand-dried, wherein it transforms into a delicacy known as a hoshigaki. An important axiom to keep in mind is that all hoshigaki are dried fruits, but not all dried fruits are hoshigaki—hoshigaki are leagues removed from your average raisin or prune. What makes them remarkable to eat is the uncommonly complex depth of flavour a Hachiya develops when dried. Open a box of hoshigaki and you’ll inhale the fragrance of brown sugar. Bite through one’s skin—which is firm like a dry fig’s and frosted white with naturally occurring sugar crystals—and inside is a mouthful of sweet gingerbread chew. The massaging is why hoshigaki are a true luxury item—the Kobe beef of dried fruit. 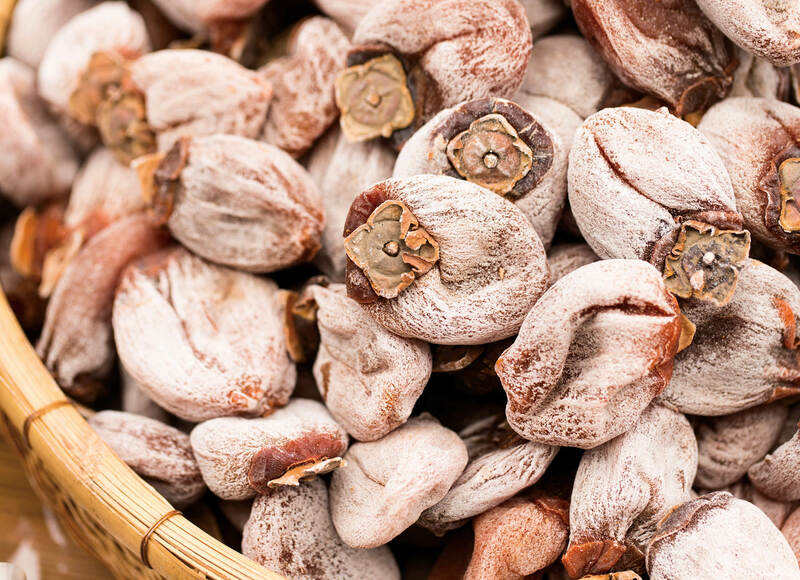 The conventional wisdom surrounding hoshigaki is that while small, homemade batches are manageable, quality commercial production is near impossible given the amount of labour drying the fruit requires. As a result, it’s a dying art in Japan (the late director Shinsuke Ogawa’s documentary Red Persimmons offers a poignant look at the fading traditional industry of hoshigaki making in rural Japan). Rieger, however, was not deterred—he now produces up to 4,000 pieces, or approximately 400 pounds, of hoshigaki per season, each one the product of a time-consuming, delicate, deeply hands-on process. It begins when he picks his Hachiyas in autumn, as the leaves fall off the persimmon trees, making for the stunning sight of pitch-black branches (the black wood of persimmon trees is used decoratively and to make excellent golf clubs) laden with vermilion orbs. He washes them, cuts off the top with a sharp, short-bladed paring knife, and peels them. Once the fruit is peeled, he moves quickly, hanging them from strings on bamboo racks he cuts from his own grove. Each fruit must have enough space not to touch its neighbours, nor the poles or strings, lest they fuse into its flesh during the drying process. Then, Rieger gently massages the hanging persimmons—every day, for up to a month. The massaging is why hoshigaki are a true luxury item—the Kobe beef of dried fruit. “People don’t always have an appreciation for how much effort and diligence and skill it takes to do,” says Rieger. “Anyone can do it, but you have to do it every day; you have to do your homework.” Hoshigaki are predisposed to mould unless massaged to control the release of moisture from their inner pulp, creating an even texture in the finished fruit, concentrating their spiced flavour, and encouraging their sugars to stabilize. Before they’re properly dry, even subtle shifts in humidity can ruin an entire batch.